The P-800 Oniks anti-ship cruise missile is a supersonic cruise missile with variants that can be deployed from land or air. Its development began in 1983, and it became operational in 2002. The missile launches from a vertical position and uses angular thrusters located near the nose to reposition itself horizontally and begin its flight path toward the target. The missile then flies at supersonic speeds, can maneuver to avoid air defense, and is resistant to electronic countermeasures. 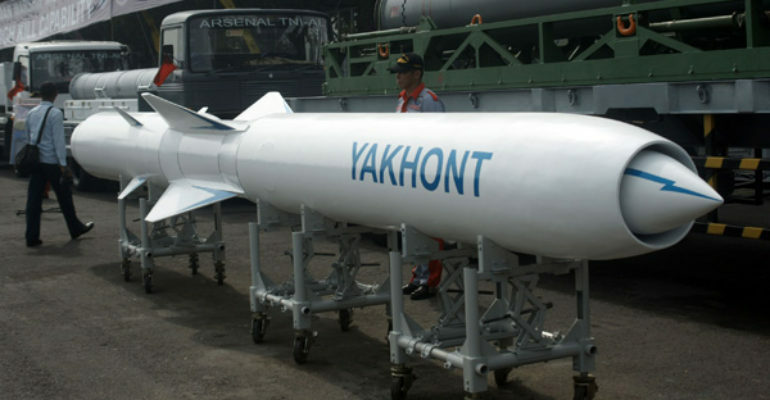 Its ground-based variant, the Yakhont, is placed on a Bastion-P road-mobile launcher as part of a coastal defense system. The Bastion-P, or a TEL vehicle, can carry two of the Yakhont missiles, which can be launched within five seconds of each other. The P-800 Oniks is primarily an anti-ship missile, but has been seeing more use against ground forces in Russia’s ongoing fight against Syrian rebels. On November 16th, 2016 Russia fired Yakhont missiles from road-mobile launchers located within Syria as part of a coordinated strike against rebel groups. This was the first instance of the Bastion system being used in a surface-to-surface capacity. On the same day, November 16th, 2016, Russia reportedly deployed two Bastion launchers to Kaliningrad, an exclave of the Russian Federation. This is significant as the territory borders two NATO members, Poland and Lithuania. Russia’s placement of these Bastion systems threatens travel through the Baltic sea. The P-800 Oniks and Yakhont missiles are very versatile weapons that Russia has exported to other countries. Russia and India have also collaborated on the BrahMos missile, derived from the P-800. In 2009, Syria purchased 72 coastal defense missiles and 36 of the TEL ground-based launchers from Russia. According to reports, Russia’s P-800 has fallen into the hands of Hezbollah, the Lebanese terrorist group. In 2006, Hezbollah used two Chinese C-802 anti-ship missiles to strike Egyptian and Israeli vessels. The P-800 is a superior weapon to the C-802, and adding it to Hezbollah’s arsenal is a threat to stability in the region, especially on the seas.